Want to make your own t-shirt pocket? Easy and mostly: lots of fun! 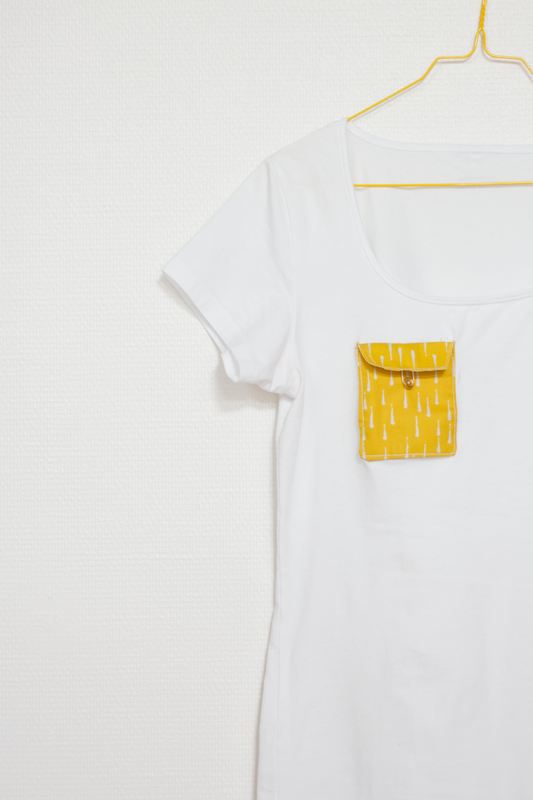 In this DIY we’ll explain to you how to make your own t-shirt pocket. This way you can use little pieces of fabric that you have left to make that old t-shirt come to life again. Perfect for the first #diymotiflow. And yes: that means there’s more to come! * An old t-shirt to pimp, of course! This can be an old t-shirt (so time to pull that messy drawer open again..). We chose a white t-shirt, so the print would stand out! But of course you can also match the color with the print. Or go all the way print and choose for example a striped t-shirt. * A piece of fabric of choice. The chance to finish up those fun Motiflow leftovers.. 15 by 15 cm should be enough. But you can make the pocket as big or small as you want. How about using the fabrics from our sample book?! * A scissor. We advise to use a fabric or textile scissor. Collect your gear as listed above. Than devise which pocket you want to make. The shape is the most important! You can find some inspiration in this blog, but we advise you to also look at other channels like Pinterest! Found the right shape? Draw it on a piece of paper and pin it on the fabric of your choice. We used the Cotton Basic, but Cotton Satin would work as well. Thereafter, you cut out the shape from the fabric. Take into account that you cut around it at least 1 centimeter. Fold the extra centimeter, so the edge of the pocket will have a neat finish when you stitch it. Pin the pocket on the t-shirt. Tip: Put on the t-shirt before you start sewing to check if it’s the right spot for your pocket! Found the right spot? Than you can start stitching the pocket. You can do this by hand or with a sewing machine. Be careful when you’ll use a sewing machine: only sew one side of the t-shirt. Otherwise you will have a fully pimped t-shirt, but you won’t fit it anymore! 😉 From experience we can say that would be a disappointment.. So, don't s(cr)ew it up! Voila, your boring t-shirt is now pimped! Everybody will be jealous! The fun part is no pocket will turn out the same. We didn’t agreed upon how we would make our pockets, so they all turned out different. For example you can stitch a button to your pocket, make a flounce or give the inside of the pocket another print (you’ll have to make a double pocket). At our Pinterest board you’ll find more inspiration. Got excited about pimping your own t-shirt? Share your DIY with the #diymotiflow. Then we can like, share and see your creations! We like!